Review: This book is pretty entertaining. It has a fast-moving plot, a variety of interesting characters, and a splash of romance. What it doesn't have is a very strong world. I feel like there was SO MUCH left unexplained, and so I spent most of the book confused when the characters referred to anything other than what was immediately happening. I mean... did they ever say what (view spoiler)(spoilers, highlight to view) made Partials, partial? No. Ever really tell us what ParaGen was? No. Ever explain what RM stood for or exactly what it did? No. Or if those questions WERE answered in the story, they were answered so stubtly/slowly that I missed it. ANNOYING! I need a fully flushed out world to be satisfied. But I'll admit the plot was still very engaging, if not very saturated. It was engaging enough to be worth 4 flowers, even with the unanswered questions. However, if Wells doesn't answer some of those questions in book 2 I will probably re-think those 4 flowers. If you're already a fan of dystopia novels, then you'll probably like this one. If you haven't been exposed to dystopia before, I wouldn't start with this one because it might scare you away from the genre. Interesting. I LOVE Dystopians, but part of my love is learning about the society that the author created. I think I'll still read this though. 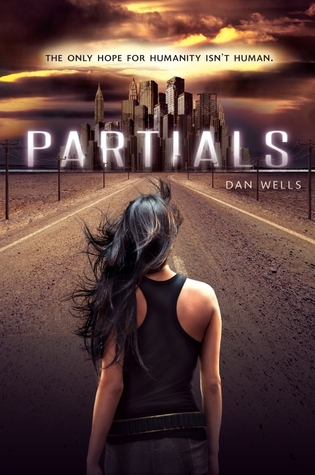 Partials sounds pretty good. I like reading dystopian novels.